You've probably already assembled one yourself but as their self-proclaimed #1 Fan, and one who prefers that all ice cream cookies be eaten, not destroyed in the making, scroll down for my tried and true technique. But first, the story behind this post, and specifically the cookie I'm celebrating on this most delicious of National Days. Because every fantastic cookie has a story! I stumbled upon Friends & Company Kitchen's goodies by accident, the way most wonderful things in life are found. I was meandering through the local grocery store whilst hungry, the most dangerous way to shop. I can't remember what kind of cookie I first bought, but it was as all their treats are: individually wrapped, reeking of scratchmade, handmade, and locally made - nearly all of the things I love in a treat. Usually I barely bother looking because as expected, they're banned from my Celiac diet. But my eye caught the label and I was thrilled to throw a gluten free (and dairy free, vegan) cookie in the basket. It was de-lish. Chewy but cakey, not too crumbly, sweet but not sugary. And when you see the ingredients on the label you can (1) read them all and (2) convince yourself it's "nutritious." I honestly don't care too much about feeling healthy when I'm indulging in my daily dose of decadence, but I do like to know what I'm eating and that the ingredients are things I could've picked up myself. I was then lucky enough to stumble upon Friends' Instagram account only to discover their bakery is right down the road (which might be more dangerous than grocery shopping hungry!). Needless to say, I found myself in their bakery last week picking up a dozen of their fabulous peanut butter cookies to "try," promptly ate a third of them and simultaneously discovered today is NPBCD. What better way to share them than with ice cream sandos? Just grab two cookies, choose an ice cream and get to work! I used vanilla on today's, but I'm thinking a fudge swirl would've been just the ticket... The possibilities are truly endless, but best when you have the perfect cookie! Freeze the cookies you're using for a few hours until they're noticeably hard and unpliable. Make sure your ice cream is also hard-ish. Not rock hard, not soft serve, just easily scoopable. You'll know. Grab your frozen cookies and ice cream from the freezer and turn one cookie upside down so the flat side is facing up. 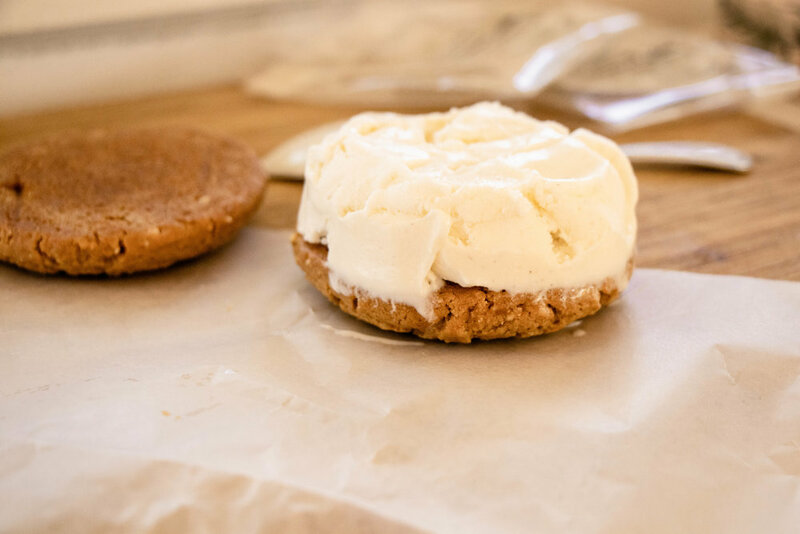 Begin to spoon small scoops of the ice cream onto the cookie being careful not to smush too hard and break it. I like to start piling in the center first and then make my way to the sides, filling in (and stealing imperfections) as needed. I tend to go right out to the edges and then scrape away excess with a spoon (read, my finger). Pile as high as you like and put the other cookie on top, flat side down. Voilà! 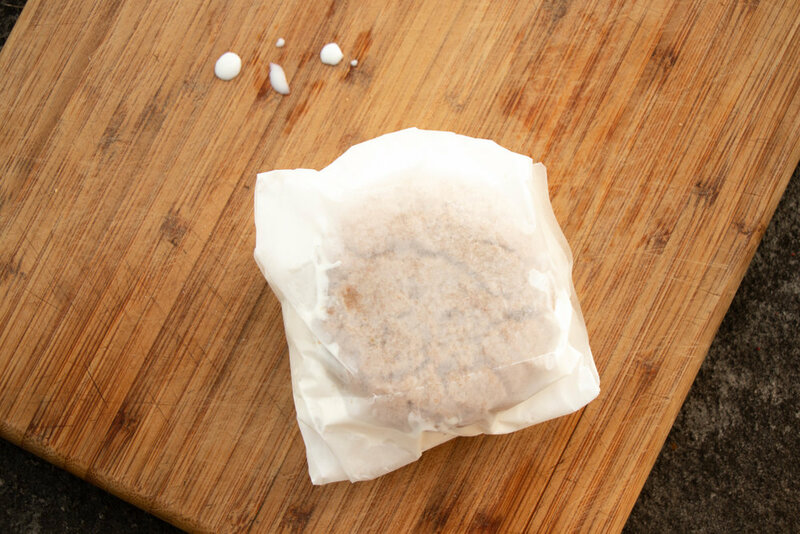 Wrap the sandwich tightly to keep the ice cream in shape and re-freeze for later. Of course, if the ice cream isn't already melting and the cookie is soft enough, eat up!